Pierre-Laurent Cassière considers sound, acoustic fields and vibrations, as a medium relating bodies and space through dynamic relationships. Out of a musical approach, his sound installations, performances or devices deal with perception limits and aim to offer very specific ways of listening. In his creative game, theoretically and practically related to art history and media archeology, audio-visual technologies become a matter to understand, reorganise and reinterpret. Along with his sound research, Cassière develops expanded cinema installations in which the deconstruction of cinematic systems and their placement in-situ offer abstract and poetical experiences based on noise and light motion. After studies in the Villa Arson national art school, Nice, France, and time spent in the Icelandic Academy of the Arts’ sound studio, Reykjavik, he graduated in 2005 obtaining a Master in fine Arts. 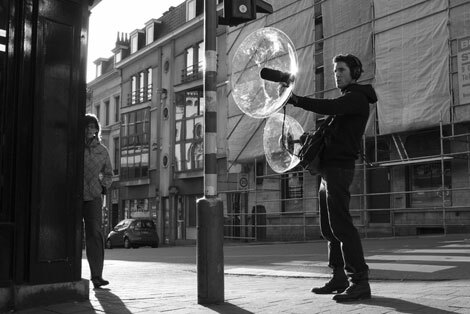 Guest student in the Kunstochschule für Medien (KHM) sound studio the next year he graduated from a Master 2 in contemporary art theory between Liege and Brussels Universities with a research on social potential of sound art practices. Since 2006, his work had been exhibited in several art institutions such as SMAK, Gent, Belgium, TENT, Rotterdam, the Nederlands, Thurn & Taxis Palace, Bregenz, Austria, Palais de Tokyo and Musée d’Art Moderne de la Ville de Paris, France, Paco das Artes, São Paulo, Brazil, or the Württembergischer Kunstverein, Stuttgart, Germany. He also took part to different film or media art festivals such as WRO Biennale, Wroclaw, Poland, the Darklight Film Festival, Dublin, Ireland, the IFFR Rotterdam, the Netherlands, or more recently to Ososphère, Strasbourg, France or Microwave, Hong Kong, China.